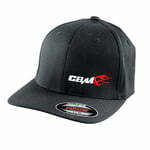 High quality Flexfit brand sports cap with CBM Motorsports logo on front and text on back. Available in Flexfit sizes S/M and L/XL. S/M = small to medium fit. L/XL = large to extra large fit.